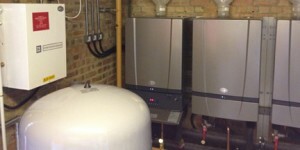 In replacing ageing cast-iron sectional boilers to improve energy efficiency at Diana House in Barnes, south-west London, heating specialists Industraheat have installed three ProCon MC115 gas-fired condensing boilers from MHG Heating. Diana House is a purpose-built sheltered housing scheme operated by the Paragon Community Housing Group and comprises 32 homes to rent, plus a manager’s flat. As part of Paragon’s ongoing energy-saving programme it was decided to replace the existing boiler plant to reduce energy consumption and carbon emissions as well as improving the reliability of the heating and domestic hot water systems. Industraheat’s Robin Scottow recalled: “In upgrading the boiler plant we have used the ProCon MC115 boilers in a cascade configuration to ensure an efficient response to the variable heating loads throughout the day. In parallel, we have installed new controls and upgraded the building management system. “A major challenge was the need to maintain domestic hot water throughout the project, which involves locating temporary plant at the front of the building and connecting it to the plant room at the rear by running flexible pipework and cabling through the false ceiling voids,” he added. Each of the boilers is fitted with a modulating burner which, combined with the cascade arrangement, provides a very responsive system while maintaining optimum performance at all loads. The building management system controls the boilers on a lead and lag basis, alternating the lead boiler to maintain similar run-times for each of the three boilers.